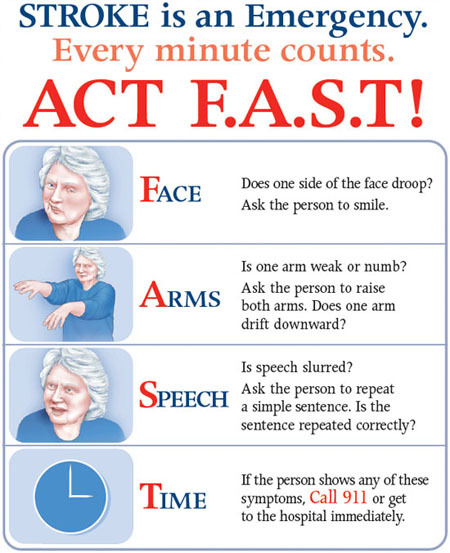 Patients who are experiencing symptoms of a stroke need to be rapidly evaluated at a hospital and treated within a few hours of the onset of symptoms to either reverse the stroke or minimize the damage. The stroke system includes a network of hospitals, EMS agencies and a high-tech communication center, the Alabama Trauma Communications Center (ATCC). These partners work to route patients with signs and symptoms of stroke to the nearest hospital that is ready to care for them. 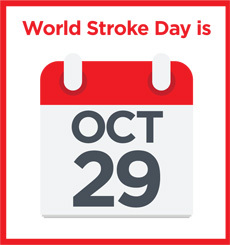 October 29 is World Stroke Day. The Stroke Association's infographic (3 MB) provides information on the signs and treatment of stroke, which kills nearly 6.5 million people worldwide each year. Visit the Stroke Association to learn more. The F.A.S.T. Infographic provides information for individuals to recognize the common signs of a stroke.